SQL Assistant equips database developers and DBAs with the productivity tools they need to speed up the database development process, improve code quality and accuracy. SQL Assistant can boost your SQL coding productivity by 300%. SQL Assistant supports all major databases. It is shipped pre-configured with support for Oracle, Microsoft SQL Server, IBM DB2, MySQL, PostgreSQL, Amazon Redshift, SQLite, Sybase ASE and SQL Anywhere. The product also offers a full-featured source control interface that supports Git, Subversion, Perforce, and Microsoft Team Foundation Server code repositories. Many users have stated they don’t know how they can code and manage their databases without SQL Assistant. To get a better idea of what it can do for you, download the trial and check it for yourself. 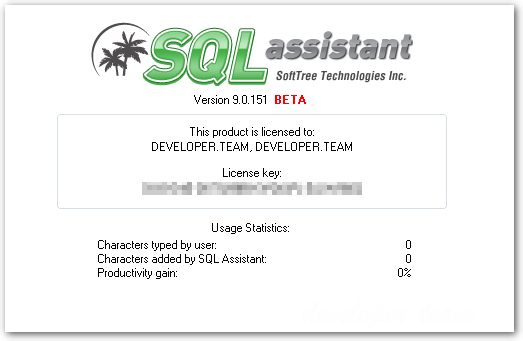 Targets Target SQL and non-SQL editors – SQL Assistant integrates with many widely used database editors and database management and development environments including native tools that come with your database systems. It can also be used to database enable many universal code editors and used as a database development plugin. Data analytics enhancements: Instant charts for query results. New SQL Assistant native toolbars for SQL Server Management Studio, Visual Studio, Notepad++. IntelliSense enhancements (all databases): hints for DML operations touching tables with triggers. IntelliSense enhancements (all databases): SQL assistance for grouped nested JOINs. IntelliSense enhancements (all databases): advanced control over generation of alises including custom methods using regular expressions, letter casing, predefined tables of custom aliases. IntelliSense enhancements (PostgreSQL and Pivotal Greenplum): support for event functions. IntelliSense enhancements (PosgreSQL and Pivotal Greenplum): support for complex table aliases with renamed columns, e.g. “FROM table_reference [AS] alias(column1 [, column2 [, …]])”. Data-grid enhancements: in-place toolbar for common operations. New code stress-testing method added to the database Unit Testing Framework. User interface enhancements: new advanced filtering capabilities in the Schema Compare results, hide and show objects and their attributes based on scope, regular expressions, and more. User interface enhancements: object references diagrams can be exported to image files. Code Structure View now offers better navigation of CTE based SQL statements. SQL Reference enhancements for SQL Azure. Code execution enhancements, friendlier display of long diagnostic messages and error messages: formatted multi-line messages shown on mouse-over event. Context SQL Search now supports sorting results by columns. Connect to Database dialog updates: user-defined connection names can be entered and updated directly in the Conenct dialog. Improvements in Oracle OCI interface: support for OCIDateTime and OCIInterval data types. Code formatting: improvemed PostgreSQL operator formatting. Macro scripting enhancements: $CURRENT(…)$ macro supports new optiona for handling special symbols. More utilities and operations can be monitored and managed now using SQL Assistant Task Manager. Improved handling of users-defined menus and commands. Support for new bulk insert methods in the data-transfer utility: implementation of multi-row inserts using single INSERT operation (Oracle, SQL Server, Azure, PosgreSQL, Pivotal Greenplum, SQL Anywhere, DB2 UDB, Redshift). Multiple performance improvements in internal operations making SQL Assistant perform many database operations faster. Enhancements in the Database Documenter: you can now attach custom database model files and save their diagrams as part of the generated database and schema documentations. SQL Assistant API now directly supports WinForms and WPF applications.